A.M. 10.1 with Jeff in 1:18:10. Did a couple of explosions, fat 0.5 in 2:59, and the last fat mile in 6:03. Discussed computers and then later the role of adrenal glands in a long race. The hypothesis is that you can slow down at the end of a long race due to adrenal fatigue, and that perhaps my "neural fatigue" is more precisely adrenal fatigue. The adrenal glands are not strong enough to sustain 5:30 pace for 2+ hours. P.M. 2 with Benjamin in 18:01. 2 with Jenny in 19:20. Julia ran the first 1.5 in 14:43. A.M. Ran with Ted and Jeff. Dropped Ted off at 6. Total time for 10 miles was 1:16:38. P.M. Julia ran 1.5 with Sarah. 2 with Jenny in 17:56. Benjamin was sick, did not run. A.M. Ran with Jeff. Accidentally met up with Ted and two ROTC cadets, ran with them for a couple of miles. Did explosions. Did two fat miles. The first one was around 6 miles into the run, and we did it in 5:58. It was perfectly flat. The second one was the last mile of the run, so bridges and slight uphill. We ran it in 6:14. Counted breathing rate in the last quarter, which was done in 1:30 (6:00 pace). Jeff breathed 35 times a minute, while I did 44 times a minute. Clearly he is breathing a whole lot less frequently than I do. Wonder what that means aside from the obvious and true conclusion that 6:00 pace is easier for him than it is for me. P.M. 2 with Jenny in 20:24. Julia ran 1.5 in 15:24. 1 with Benjamin in 9:38. A.M. Ran with Ted, Jeff, and Colby. Did a pickup for a quarter at 5:20 pace and counted my breathing rate. 51 breaths per minute. What is interesting is that it takes me the same number of breaths to cover the same distance at 6:00 as it does at 5:20 pace, except I do it faster because it takes less time to run the distance. 32 breaths per minute at 7:20 pace. Ted and Colby turned around at 3 miles, Jeff and I went on and marked the race course as we went. I did explosions early in the run, and then we ran a fat mile in 5:58 at the end of 10.1. Total time was 1:18:36.
into /var/lib/bluetooth/nokia_addr/pincodes. Replace scanner_addr and nokia_addr with the actual bluetooth hardware adresses of the devices.This secret was discovered with the help of strace. Good old strace has saved my rear end many times. Trick number two was to reverse engineer the data transfer protocol, but fortunately Brendan Johan Lee had already done it for me. So I ported his driver to run on Nokia 770 and log the barcodes to a file along with a time stamp. My hack is available for those who needed it. Ran 1 with Benjamin in 8:22, and 2 with Jenny in 18:52. Julia was not feeling well and did not run. A.M. Fast Running Blog 5 Miler For Frugality And Against Obesity, 27:11, 2nd pace. This was an interesting experience. This was the first race I have ever directed. I figured if somebody wanted (more) cash I'd make him work for it, so I jumped in the race myself too. After all, this was a race for frugality, so I figured it would be a good idea to make the Fast Running Blog investment count to the highest extend. Sarah, the kids, Ted, Kimia, and a few others helped with the race logistics, which made it a lot more manageable. We got organized, and got the race started. Jeff and I quickly pulled away from the competition. First mile in 5:14. Felt easy. Jeff had already run 15 miles at around 6:20 prior to the start to simulate running on low fuel. So he said to me he wanted to go faster to run out of fuel. I asked him to hold back for one more mile. Two reasons. One, I did not want to run 4 miles alone. Two, I did not want Jeff to run out of fuel prematurely. So he agreed and backed off. A bit too much. Second mile in 5:24. That started to feel way too easy. Then Jeff picked it up. I went with him, but after a 200 in 38 I realized it was not a good idea, too fast. So I eased off to 5:20 pace. Hit the turnaround in 13:17, on pace for course PR, that is exactly what I got in August 2007. Incidentally Jeff was with me. Except back then he was not as fast, so he could not drop me even fresh, much less after running a brisk 15. So he stayed with me until one quarter to go, and then I dropped him and we got 26:48 vs 26:50. However, as soon as I made 180, my adrenaline was gone. Not surprising, directing even a low-profile race does carry a measure of stress, so when racing at PR level you are going to feel it. At least that is what I think happened. I have noticed that some days I recover from a 180 or a hill just fine. However, other days, a hill or a 180 breaks me badly. Textbook exercise physiology says, well you have work harder to get back up to speed (or run harder up a hill), so you build up too much lactic acid, and then cannot recover. There is something not quite right with this explanation. Try as I might I cannot push my RER past 1.06 even when I am doing quarters every week. With no interval work it stalls at 1.04. That is in a 5-10 minute V02 test, not in a 5 mile race or tempo run. For a comparison, a middle distance runner can get up to 1.15. While RER is not a direct measurement of lactate levels, it should correlate pretty closely. RER is the ratio carbon dioxide out to oxygen in. If it is greater than 1, you are into oxygen debt. So in short, the measurements have shown I do not have a whole lot of ability to go into oxygen debt. I have previously thought that this difficulty of handling changes of pace might have something to do with the nervous system not being able to go into overdrive. Recently, though, I am leaning towards the adrenal failure theory. It takes quite a bit of adrenaline to run 5:20 pace. You can be aerobically and muscularly fit, but if the adrenaline is not there, the heart would not beat fast enough, you would not breathe hard enough, and the glycogen in the muscles will not be made available fast enough. The symptoms seem to match. HR drops to the right level for the pace, but for the life of me cannot go up any higher even for 50 meters. The breathing slows down. The legs do not hurt, they just cannot go any faster for no apparent reason. So to make the long story short, I slowed down. 16:04 at 3 miles (5:26, but the last 0.5 at 5:34 pace), 21:38 at 4 (5:34), and the last mile in 5:33. I was happy with the performance, though. I missed my course PR by 23 seconds, but I could run the first half on pace, and it felt easy. And I did not die too badly. Jeff won with 26:35, Steve Cutitta was 3rd with 28:18. 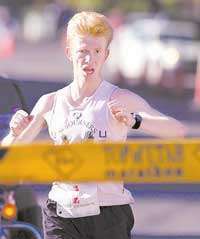 Mary Ann won the womens with 29:45, and chicked everybody else. When I finished I made sure the finish chute was being handled, and ran back to Benjamin. He ran 39:10. He was still not fully recovered from getting sick a couple of days ago, so I was not expecting a whole lot. But at least he could run 7:50 pace. Finished timing everybody, ran 1.5 to the house with Julia in 16:37, then ate a snack (two bananas and evaporated cane juice magic drink), and then went for more punishment/conditioning. Decided I would run the Uneventful Half in 1:20 for a challenge. Ran the first mile in 6:13, second about the same, no mark due to altered course (due to flooding under the bridge), then eased into 6:00, then a little under, and coasted hoping I would not crash too badly. Kept it under 6:00 for a while until I started hitting the uphill and the bridge tunnels. Slowed down to 6:08, felt embarrassed, an odd feeling, I was still passing runners on the trail pretty fast, including bikers, but I still felt embarrassed because it felt slow and I could not go faster. Then turned around past Maceys, and started heading downhill. A welcome relief, now 5:52-5:56 pace again, but that's all I've got. With 100 meters to go my prayers were answered. When I hit the desperate plateau I started praying for help to get out of it. Finally the Lord sent me help. It was a little feisty dog. It started barking at me and chasing me. I knew what I was supposed to do - get angry at it and run faster. But I had a very hard time. Finished with 1:18:47, a little slower than 6:00 average. P.M. 2 with Jenny in 19:41. Hiked the Y with Sarah for a date as well. It took us 24:36 to walk from the start of the trail to the bottom of the Y.